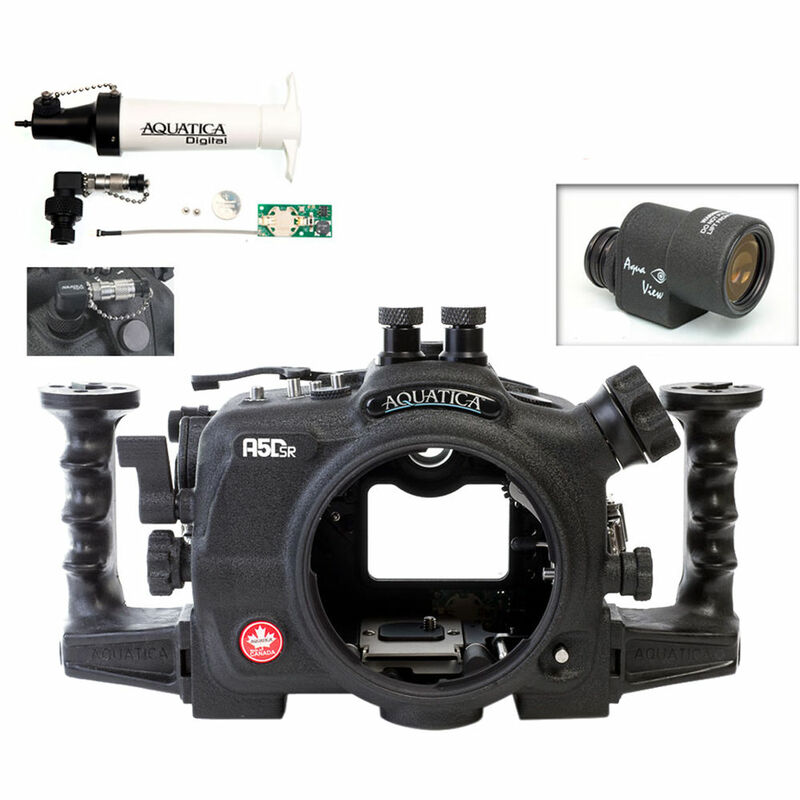 Capture detailed still images and Full HD 1080p videos of parrot fish, moray eels, and coral reefs with Aquatica's A5DSR Pro Underwater Housing, which is designed for Canon's EOS 5Ds, 5Dsr, and 5D Mark III DSLR cameras. It has a depth rating of 295', which is upgradeable upon request to 426'. This version of the housing also includes a pre-installed vacuum check system, which allows you to confirm watertight integrity before the dive. Dual Nikonos connectors enable the attachment of optional external strobes. The standard, coated eyepiece offers a full view of the camera's viewfinder, and the coated Aqua View Finder, also included, offers an enlarged, enhanced view with 100% coverage, corner-to-corner sharpness, and dioptric adjustment. The housing provides access to virtually all camera functions via mechanical controls. It also has an ergonomic design with 2 grips that offer improved handling and attachment points for optional lighting arms. Built for durability, especially resistance to corrosion, the housing is constructed from an anodized, machined aluminum alloy and stainless steel. and Type 4 Port Chart. Box Dimensions (LxWxH) 12.5 x 12.3 x 6.5"